Archos debuted their new Gen 10 Android tablet via their official Facebook page Wednesday night. 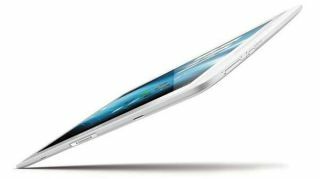 According to the post, an announcement about the ultra-thin tablet's launch is expected in three weeks. The G10 tablet was teased earlier this year on Archos' YouTube channel, but little had been heard or seen about the device since then. Though the Android tablet has been in development for quite some time, currently little is known about the features and specifications of the G10. However, one feature prevalent in a preview video and the latest images is a keyboard dock. Whether it will be optional or not remains to be seen. With the G10's late August launch announcement pending, there are questions as to which version of Android the tablet will run. Since Archos' upcoming tablet has been in development since earlier this year, it wouldn't be surprising to find the G10 operating Android 4.0: Ice Cream Sandwich. Of course, with Android 4.1: Jelly Bean's arrival just a short while ago, there is a small chance the G10 could be running the latest update. Until Archos is ready to divulge more details later this month, we'll have to wait and see just how much of an improvement the Gen 10 is over their Gen 9 devices, like the 101 G9.